SERIOUS Investing: There are others cheaper than Digi - So? If you are an investor of Digi and probably may think of switching - Consider this. Ever since Telenor bought over Vincent Tan's ("VT") stake in Digi, investors who stayed with Digi until now has uncountable returns over a period of 10 years. In 2001, Telenor bought (from VT) and increased its stake in Digi to 61%. At that time the price went to as low as below RM4 sometime around 2003. Now less than 10 years after, after two rounds of capital repayment, huge dividends with yields of 4% to 8% every year, it is now priced at RM3.94 - and did I forget to say that this price is after a 10 for 1 split last year. All these things were in a short span of less than 10 good years. Hows that? Hence, how can you fault a company that gave you such a return. Now, annually Digi is continuing to provide a dividend yield of 4% to 5%. You do not bite the hands that feed. But what if I tell you that there are better value stocks than Digi, and you do not need to look far. What if I tell you that Maxis and Axiata are even more attractive than Digi? Yes, its own competitors. Just look at the below table. If you look at purely PE Ratio alone, it is fantastic that investors are valuing a third player higher than its peers. Normally, investors are more susceptible to providing a higher value to the leading player than its lower ranked competitors. This shows how much value creation the Telenor group has provided to its shares. Why? This I attribute to the way Digi under Telenor treats its shareholders. Besides providing value and good return, they have been by far the most consistent among the three. Ananda Krishnan is not AK if he does not list and delist and list back companies. This becomes his hobby! That action of inconsistencies, to the shareholders is not good. Although any investors who invested into his group of companies would have made good money from their holdings the action of pulling back a listed company and list them back does not augur well for people like me - pure investors. Just look at the stats above for Maxis. Why is the NTA negative? Well, these I believe is what he does to his holdings. Prior to the original Maxis being delisted, it used to hold telco businesses in Malaysia, Indonesia and India. The Malaysian one is a cash cow whereas the Indonesian and Indian entities needed more cash injections. Very usual for any businesses. But AK was concerned. As it is not so nice for a listed firm to reveal too much to the public (due to the value deterioration it can appear to create), he delisted the group and list back the Malaysian entity alone. Along the way, CIMB is probably the only one makes good money! - How wasteful. And Maxis Malaysia was geared up to pay for his foreign foray. While it is not a matter of concern, what makes people peeved over the entire exercise is the shuffling of balance sheet in the individual companies. Having said the above, currently, Maxis Malaysia is still a very investible concern and in fact it is more attractive, valuation wise compared to Digi. What about Axiata? Well, Axiata's current position is what AK does not want investors to see. If you noticed, Axiata's market capitalization is about the same as Maxis Malaysia. How is that possible? Celcom's (which is in between Maxis and Digi) size is only slightly smaller than Maxis but yet by buying into Axiata, you are getting the Indonesian, Singapore, Thailand, India, Cambodia, Sri Lanka businesses etc. in one stock. I noticed that some analysts used to be concerned over Axiata's debt. Hello? With the telco's nice positive cashflow yearly, they are overly concerned. 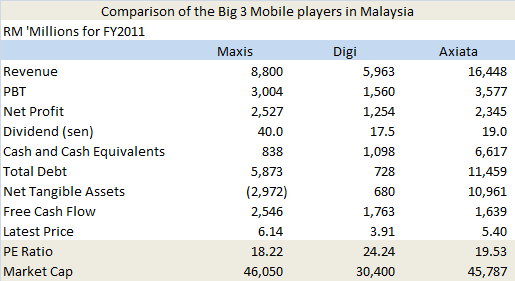 Among the three telcos, Digi has the better balance sheet as its debt is lower as compared to Maxis and Axiata. In any case, as the companies are generating healthy cashflow, debts should not be a concern for all three. In fact, judging from the position they are in, I am not worried over the balance sheet position for any of them. Well, from the above, if you continue to believe the good things that Digi will provide, stay with the stock. But if you venture out, probably Axiata and Maxis will provide better returns over time. In terms of what is going to happen to these three companies business wise, I believe they probably would stay at where they are - as it is! There probably won't be much happening except for all three waiting for LTE to deliver. Over the next 5 years, the biggest challenge for these telcos is growth as their numbers seem to stagnate more recently especially last 1 year. (Under a non-scientific method) When comes to quality of service, most people would rank the three telcos in the following order - Maxis, Celcom (under Axiata) and Digi although one could not differentiate much between Digi and Celcom.